After a year of testing and tweaking, it is finally here! The simple box that will change the way you get your entertainment and reduce the money you pay for entertainment each month with this one device. Getting high-quality entertainment while saving money…who knew? The good folks here at JBM have worked very hard to bring you a box that is simple to use, future-proof, and provides the audio and video quality that we need for our crazy high standards. Let’s get into the meat and potatoes of it. Imagine a DVR with unlimited space and access to all your favorite shows, whether they be on network tv, HBO, Netflix or Amazon, you can access them all. Any show, any channel, any streaming service. Watch it when you want to watch it, and without commercials. Outside of sports, we have not used our Dish Network for TV in a year. This will really change the way you think about getting your entertainment. Imagine your very own movie video store with almost every movie you can think of. Get all the latest and most popular movies in Dolby Digital or DTS surround sound. There are many ways to search for the movie you want to watch, including most popular, trending, movie mosts or simply type in the title you’re looking for. $299 for the box. We have 2 streaming packages. $20 per month, or $100 for 6 months (5 months, 1 month free). It won’t take long to pay for itself. For example, our Dish bill was $180 a month. We had every channel including every movie channel. We are sports nuts, so we couldn’t cut the cord completely. We scaled back our programming to the lowest package that included ESPN and Big Ten so we continue to get our sports fix. That put our Dish cost at $80 a month, saving us a $100 a month. $1200 a year….our box cost $299 + $200 for the year of streaming, for a total of $499. So as you can see, you come up on top moneywise. Yes. You are not downloading, uploading, or storing any content. You are streaming content readily available on the web. So as long as you are not selling tickets, it is perfectly legal. If I have more than one box, do they sync? They sure do, even to the point of starting a movie or show on the box, stopping and picking up right where you left off on the other. We use a service called Trakt.tv that allows all the boxes to sync up. It is pretty slick. Do I have to pay a streaming fee for each box? No! One streaming subscription will cover all of your devices. We can always be reached via email to answer any questions you might have. I know your box streams everything, but what if I want to use Netflix or some other streaming service as well. Can I do that? Shhhhhh! We don’t like to advertise this, but yes. 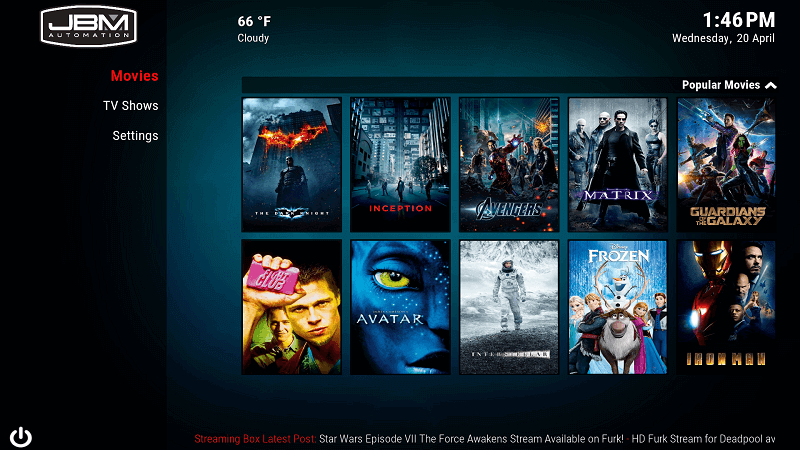 The backbone of the box is android, so you can use any app that you can get from the Google Play Store, including Netflix, Hulu, Amazon, HBOgo, etc. When we say it streams everything, we really mean everything. Is this box software upgradable? If so, do the upgrades cost me anything? Yes, this box is upgradable, and no, they don’t cost you any more. Upgrades are included in the streaming and support fee. 99% of all upgrades you can do from home using our streaming wizard. When a major upgrade comes down the pipe that we can’t do remotely, you send the box back to us, and we will upgrade it for you and send it back right away. These might happen once a year, and it is your choice to send it in for the latest and greatest software. Turn around time for this is usually 48 hours from the time we get it, to the time it’s shipped back to you. We are always making these boxes better, and you will be kept informed via email and the RSS feed on the bottom of the screen of your box when an update is available. What can’t your box do? 8/25/2016 – After working very hard with our partners, not much. Movies, TV, Live TV, ESPN, it can do it all. Live TV and Live Sports….sorry there just is no reliable way to make this a part of our box at the current time. No news, no sports, no live TV.